USS McFaul (DDG-74) arrived in Cobh this morning. Last edited by Goldie fish; 27th October 2007 at 23:37. I just reshuffled them into the correct folder. Link duly edited. LE Orla was also present. Last edited by moggy; 15th November 2007 at 20:08. It'll be the most unsuccessful sales promotion ever! On the Hunts yes. 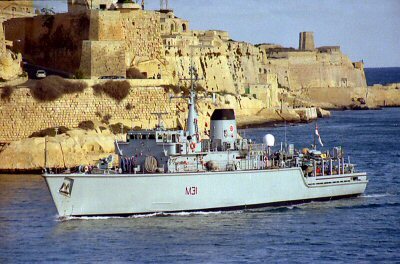 First class of minesweeper to use fibreglass hulls, which was first tried out on a TON type. Its definitely a sales pitch. They are not on any "tour" of european ports. They both return to Den Helder for the 22nd, and were in Plymouth on the 7th and 5th, and Devonport on the 6th. Prior to that,Rotterdam was back in Den Helder. Johan de Witt was first to arrive, heading upriver with the tide. As I was watching from the Bull Wall, a rather red-faced elderly gent came along and asked "Is that a battleship? It'll be just like Shannon Airport, with all those American aircraft. We'll be a target now, you know. They don't realise Ireland is neutral!" Then he stalked off with his dog, probably composing his letter to the Irish Times. Good thing the submarine thread was closed then. Good thing too that the Navy of the Netherlands operate ships like this, which are engaged in a thing called "anti submarine warfare". Major auxiliaries like Rotterdam, never work alone where there is a submarine threat. Its definitely a sales pitch..
Are proposals for vessels which do not conform to the vessel dimensions set out in Appendix A and/or B of the RFP acceptable. No. Vessels must be within the range of dimensions set out in the “Statement of Requirements” set out in Appendix A and/or B of the RFP. Who said they were trying to sell us that class? No-one, I just find bringing in two vessels of a separate class to the one specified in the tender, in order to sell one which would, a slightly unusual sales strategy to be honest. If it's just a display of the prowess of Schelde/Dutch ship building in general, would one not have sufficed? When I saw the dimensions I had visions of the other contenders crying foul if it had been selected, culminating in a cancellation and no EPV. Anyway, leaving my slight paranoia to the side, it'll be interesting to see how this pans out.